Skógafoss waterfall in south central Iceland. Shot with Lee "Big Stopper" 10 stop filter to achieve a smooth waterflow in daylight. Processed in Lightroom. 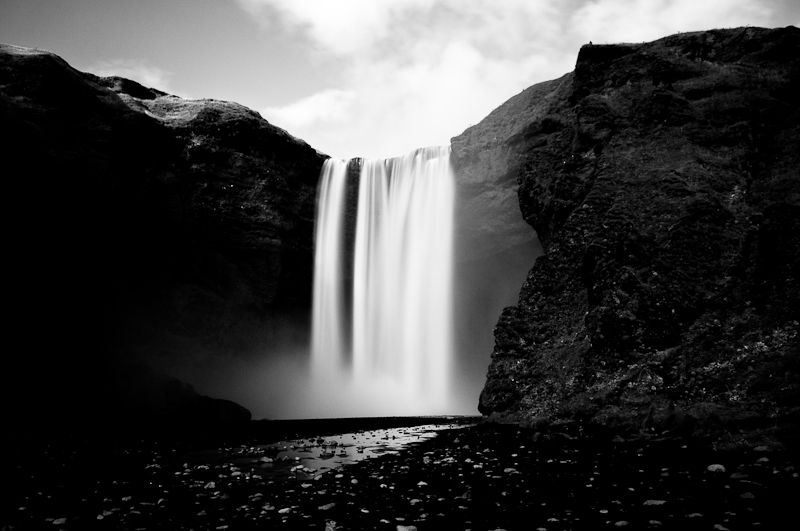 Converted to black&white, darkened (underexposed) the shadows to let the waterfall stand out more. Increased contrast and clarity. Curves. Excellent high contrast B&W. Great long exposure. Lovely image, nice BW post. It may sound odd, but this is a very "masculine" image. Very bold tones and solid shapes, with just the softness of the water and mist for contrast. Very appealing. Hmmmmm. Sky and waterfall look correctly exposed and the rocks clearly underexposed... but what is the main subject of the photo? Proudly hosted by Sargasso Networks. Current Server Time: 04/23/2019 07:53:44 AM EDT.